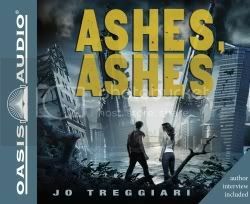 This past week, the kids and I have been listening to Ashes, Ashes by Jo Treggiari, and read by Cassendra Campbell. Dale started listening with us, and ended up having to take the iPod with him to work so he could finish the story. I initially requested the book because of the post-apocalyptic themes and the fact that it was a teen book, so I hoped at least my three oldest children would enjoy it. After I got it, and listened to the author interview, I was a little worried. Lots of talk about a strong heroine in the interview, and then I re-read some of the blurbs about the book, seeing things like "romance" front and center. How did I miss that when I was requesting the book? I knew I would be able to listen, but would my male-dominated family go for it? The world has ended... What comes next? Smallpox epidemics, floods, droughts—for sixteen-year old Lucy, the end of the world came and went, stealing with it everyone she ever loved. Even the landscape of her beloved New York City is ever-shifting and full of hidden dangers. As the weather rages out of control, she survives alone in the wilds of Central Park, hunting and foraging for food and making do with the little she has, while avoiding roving scavengers and thieves. But when an unrelenting pack of vicious hounds begins to hunt her, Lucy is not sure she can continue on her own. Then, suddenly, she is swept to safety by a mysterious boy named Aidan, who helps her escape the hounds and urges her to join a band of survivors. Reluctantly, she finds him after her home is destroyed; however, new dangers await her. An army of Sweepers terrorizes the camp, carting off innocent people and infecting them with the plague. Lucy and Aidan realize that it's up to them to save their friends, but Lucy doesn't know that the Sweepers have laid a trap—for her. There is something special about Lucy, and the Sweepers will stop at nothing to have her in their clutches. Jo Treggiari spins a thrilling tale of adventure, romance, and one girl's unyielding courage through the darkest of nightmares. So, I put the book on the iPod, and started it with the beginning of the story (NOT the author interview). The story starts with a dead turtle, and Lucy mutilating it. I think everyone was listening with a raised eyebrow, asking "why is Mom having us listen to this?" I know my husband was, because he stopped the iPod and asked me. I told him enough that he was willing to give it a couple of chapters. The kids really didn't have a choice. In those first couple of chapters, we learn a bit about Lucy. Lacking confidence and abounding in clutziness, she was an easy character to relate to. That helped. An hour into it, and we're dropping Dale off at work... and he informs us that we can't listen during the day -- we have to wait and listen on the way home that night. He wanted the whole story too. The basic plot is that 99% of earth's population is wiped out by a smallpox epidemic. There are also strange weather patterns, earthquakes, tsunamis, you name it. New York City is now known as New Venice, and that is where the story occurs. What I loved about this story is that we are following a fairly normal teen girl. Someone who didn't grow up going on wilderness survival camping trips -- but has the opportunity to learn survival skills in a pass/fail environment instead. And she is passing. On her own, she is surviving. Barely, but still. She is making it. One very funny moment is when she is reflecting on information that she read in the survival manual she had found. I don't remember the critter now, I think it was the turtle, but she relates that the survival manual praised its meat as high protein and low fat. Umm, you know, low fat is NOT exactly an advantage in a long-term survival situation, and is just not something that a survival manual ought to be praising. The majority of the story is told from Lucy's point of view, and as a result, her character is very well developed. We understand what makes her tick and what makes her come unglued. We know her fears, her longings, her thoughts. None of the other characters in the story are developed as well. It works though. The story comes out like we are either reading Lucy's journal, or looking through her eyes, so naturally, our insight into the other characters is limited to what Lucy perceives. One thing I did like was that the characters -- male and female, young and old -- were all doing something. Hunting (with bow and arrow -- there was a conspicuous lack of firearms), gardening, hauling water... all the "strong female" talk had me worried that the book would involve inept male characters. It didn't. We all enjoyed the book. Dale picked apart a lot of the details, and found parts of it far too predictable. He & I agreed that while we felt fairly certain of the final destination, the path through the story did have a couple twists we didn't anticipate. Disclosure of Material Connection: I received this audiobook free from Oasis Audio as part of their Review Program. I was not required to write a positive review. The opinions I have expressed are my own. I am disclosing this in accordance with the Federal Trade Commission’s 16 CFR, Part 255: “Guides Concerning the Use of Endorsements and Testimonials in Advertising. Great review! Thanks for your thoroughness, Debra!